‘Postmodern animism’ first emerged in grassroots Japan in the aftermath of mercury poisoning in Minamata and the nuclear meltdown in Fukushima. Fusing critiques of modernity with intangible cultural heritages, it represents a philosophy of the life-world, where nature is a manifestation of a dynamic life force where all life is interconnected. This new animism, it is argued, could inspire a fundamental rethink of the human-nature relationship. The book explores this notion of animism through the lens of four prominent figures in Japan: animation film director Miyazaki Hayao, sociologist Tsurumi Kazuko, writer Ishimure Michiko, and Minamata fisherman-philosopher Ogata Masato. Taking a biographical approach, it illustrates how these individuals moved towards the conclusion that animism can help humanity survive modernity. It contributes to the Anthropocene discourse from a transcultural and transdisciplinary perspective,thusaddressing themes of nature and spirituality, whilst also engaging with arguments from mainstream social sciences. 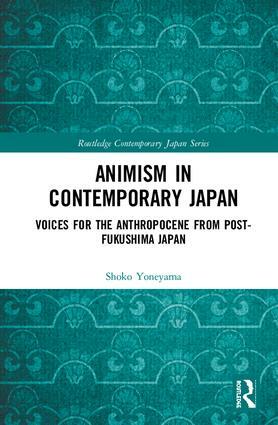 Presenting a new perspective for a post-anthropocentric paradigm, Animism in Contemporary Japan will be useful to students and scholars of sociology, anthropology, philosophy and Japanese Studies. Shoko Yoneyama is a Senior Lecturer in Asian Studies at the University of Adelaide, Australia. Her key publications include The Japanese High School: Silence and Resistance (Routledge 1999).